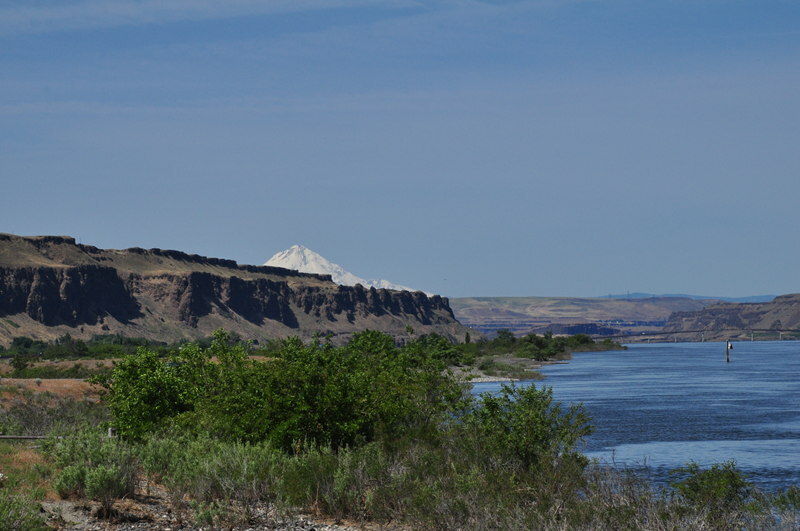 After Peach Beach in Maryhill, WA, we traveled a few miles east on the I-84 to Rufus Landing Recreation Area near Rufus, OR. 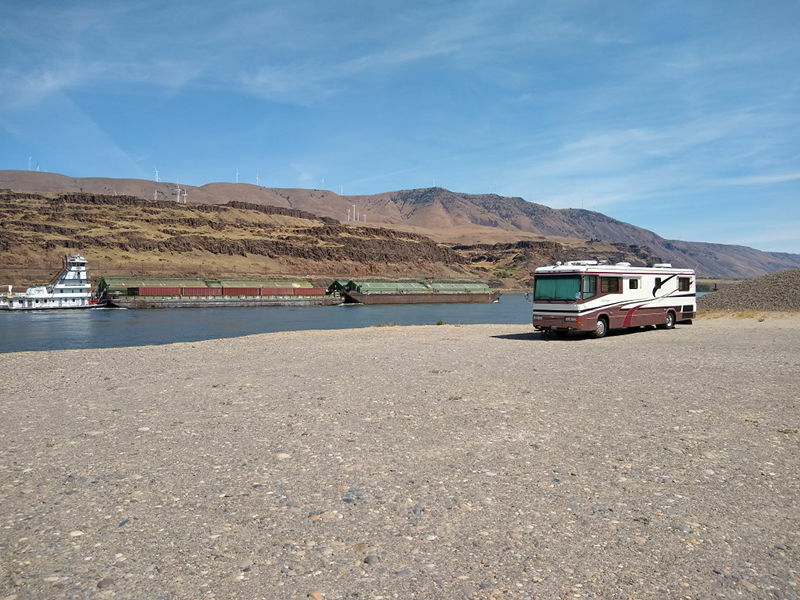 This is a well known and excellent boondocking place with easy access right off the I-84, so you won’t be alone. We arrived on a Monday around 1 pm and there was only 4-5 RV’s, by 8 pm there was around 25. 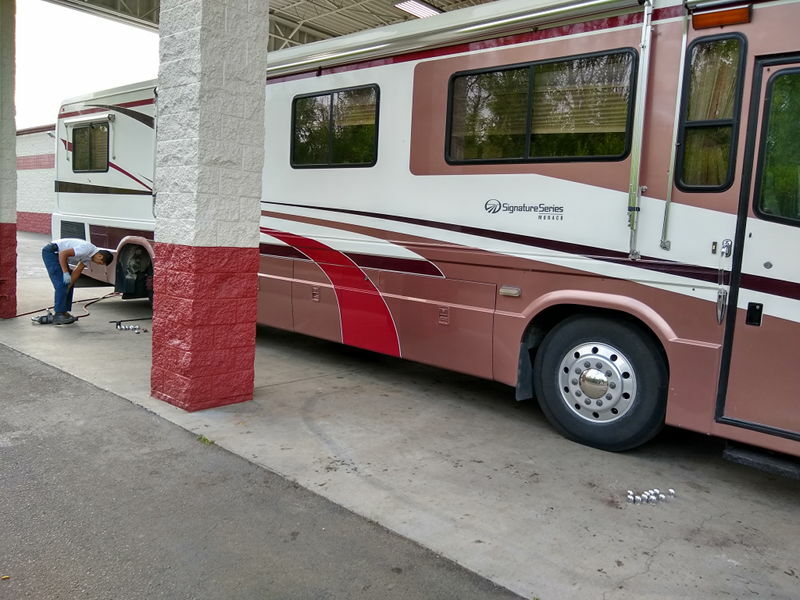 We ended up staying for 3 days, after that we had to be in Portland to get some new tires for the RV. Having read Wheeling It’s post on Rufus Landing before arriving, I knew there were some areas where the ground was soft and the RV could get stuck. There was a soft sandy area right behind where we parked. 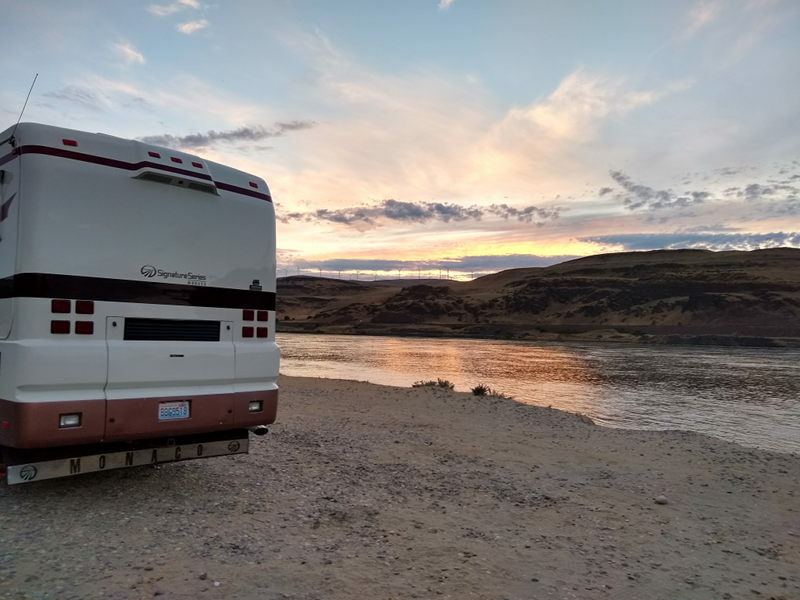 We parked right next to the Columbia river and had an amazing view of the river and the sunsets. You also get a little bit of a view of Mt. Hood on a clear day. Other sites were more level than the one we chose as we needed to add a few wood planks under the rear jacks in order to get level. But those other sites didn’t have near as good of a view. It all worked out. We also followed the advice of others and parked east-west so the wind wouldn’t hit us broad side. We are glad we did this. 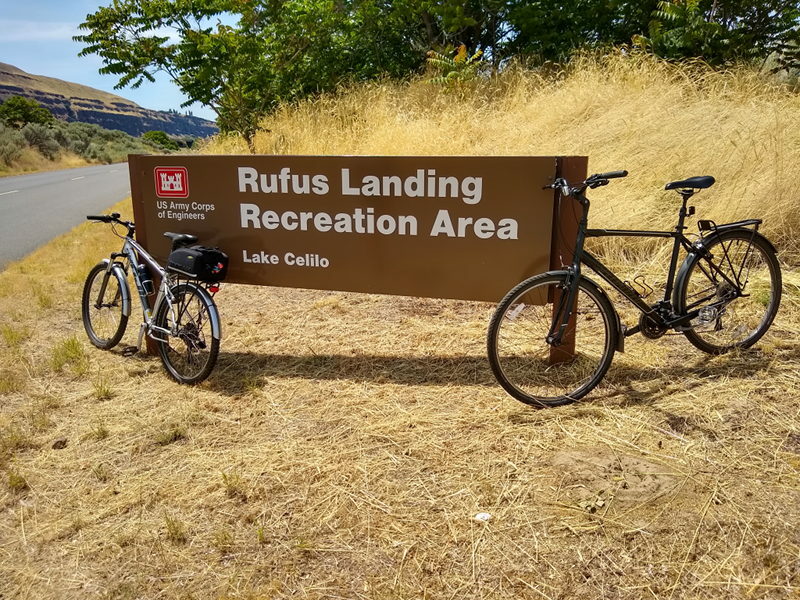 Rufus landing is right next to the I-84 and has frequently used train tracks to the North and the South. However, the higher than average wind speeds in the area create somewhat of a buffer of white noise to drown them out. Yes, you will hear traffic and trains but I didn’t find it too bad, at least they didn’t keep me awake at night. If fishing is your thing, there were quite a few fishermen in the area and they looked to be doing very well. I watched many fish being reeled in by anglers on shore and it looked like the fishermen were having a good time. 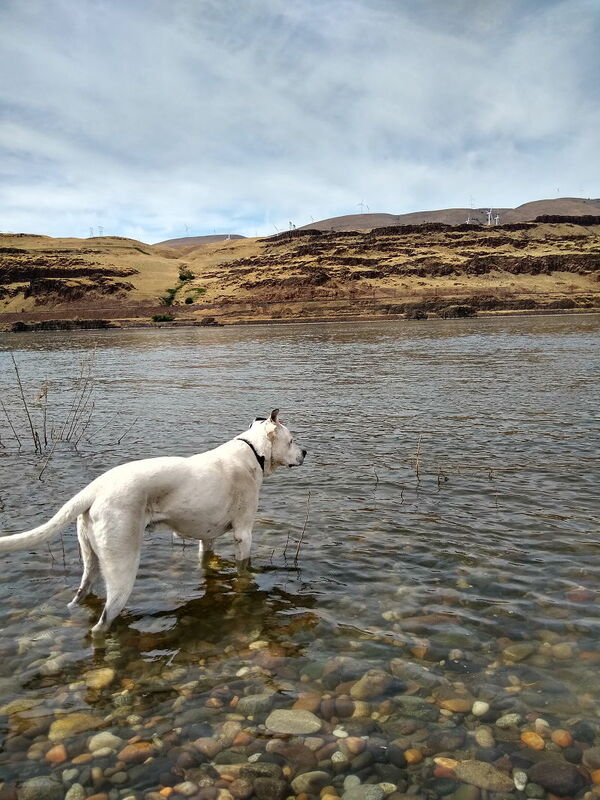 We haven’t gone fishing in years but we’ve been thinking about getting some fishing poles so that could enjoy the sport of fishing. Because we didn’t have any poles with us, we just played in the water to cool off and hung out on the beach. The day we were planning on leaving, the winds picked up in a big way and the sand started to blow. We decided to leave early that day and get out of the sand blaster, sand was getting everywhere. I’m not a fan of driving when it’s this windy but we needed to get out of this sand storm. Although the wind wasn’t ideal on our last day, we did enjoy our stay here. The sunsets and the views were spectacular! We will definitely be back if we end up on the I-84 and need a place to stay. Now to get some new tires for the RV in Portland before meeting some family on the coast. Hi! It sounds like you are finding your groove! We love and miss you! Hi Michele and Jorge! Thanks for reading our post. We are slowly getting the hang of it. Hope Ecuador is a blast and South America is treating you well. We love and miss you too!